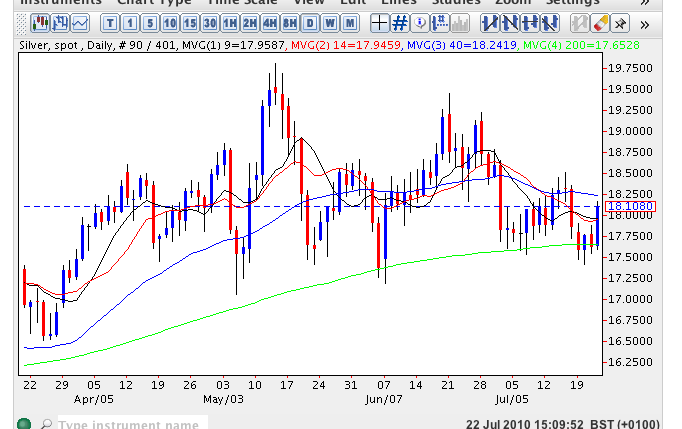 Spot silver prices continue to trade sideways perched on the 200 day moving average suggesting that this is providing a platform of support from the recent pullback. Indeed in early trading so far today the 200 day moving average has once provided a platform with silver prices attempting to push higher and break above the 9 and 14 day moving averages and through to $18 per ounce and above. Whilst the longer term outlook remains firmly bullish in the short term we seem set for a further period of sideways consolidation which will only be broken once we clear initial resistance at $18.81, followed by $19.45 and then on to $19.81 and beyond. Provided the 200 day moving average continues to offer firm support then the medium to long term outlook remains positive.